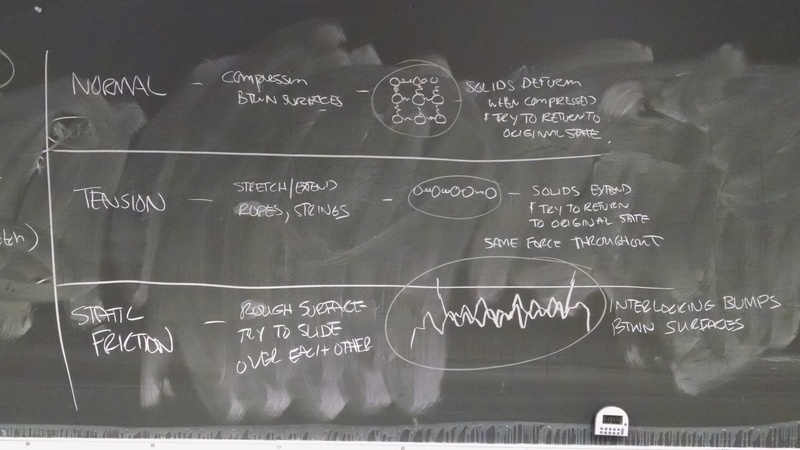 College-Prep Physics: Since our last look at force diagrams, we’ve explored tension and friction forces. So we did another set of interaction and force diagrams, this time incorporating tension and friction forces. Use force type notation — FN and Ff — but that doesn’t emphasize the objects that are interacting. Also doesn’t lend itself to easily finding 3rd Law pairs. Replace F with force type — NA on B and fA on B — but that doesn’t emphasize that they are all forces. Modeling makes a similar emphasis with energy — using Ek and Eg rather than K and U. 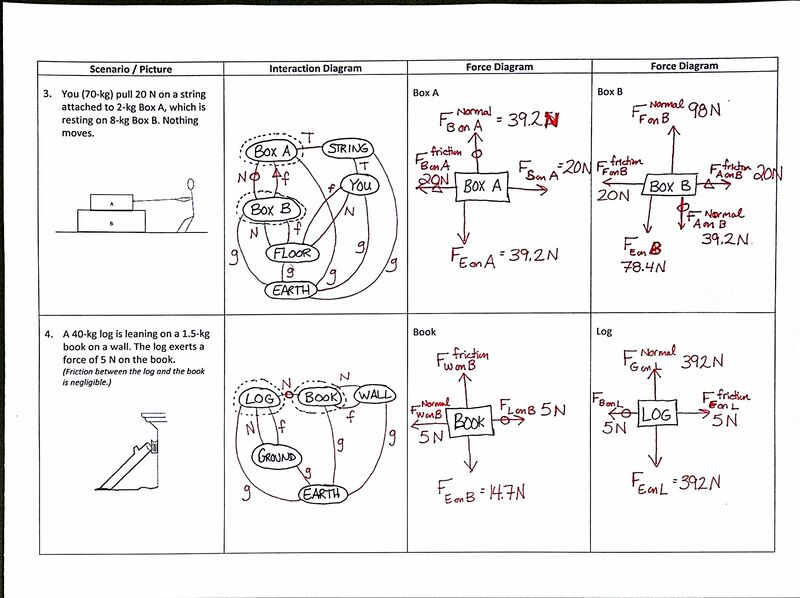 And on this sheet, like the other one, I had scenarios where more than one force acted on an object in the same direction (#2, #3) and a scenario where the normal force wasn’t equal to the object’s weight (#3). 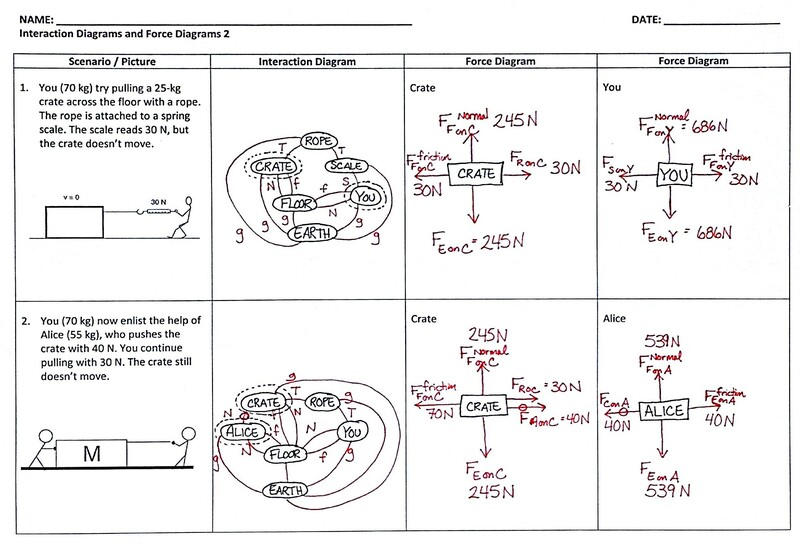 I also asked students to draw force diagrams for 2 different objects in each scenario. This allowed us to see 3rd Law pairs (indicated with circles and triangles on the force diagrams and interaction diagrams). 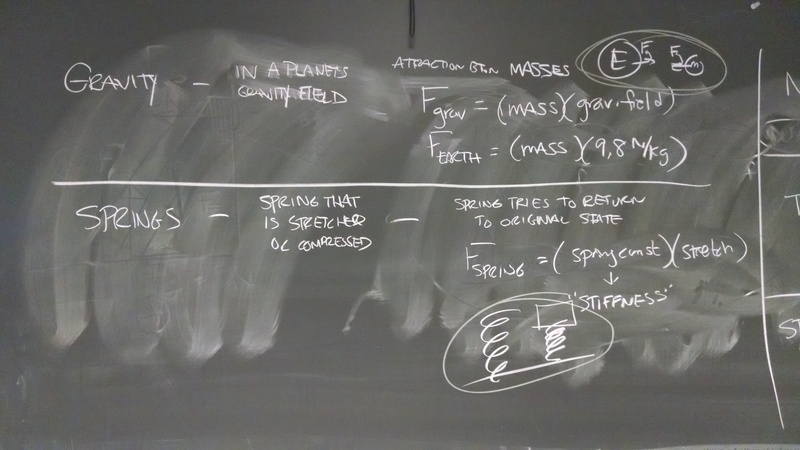 Finally, we figured out the values of all the forces. Identifying those 3rd Law pairs was necessary in order to find the values for some the forces. We wrapped up with a summary of the forces we investigated so far. I’m trying to emphasize the mechanism of how the force works — this was the purpose of all those voting questions from Preconceptions in Mechanics. FORCE — When is it present? — How does it work?